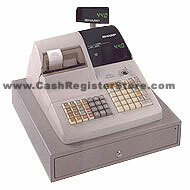 Sharp ER-A440 Electronic Cash Registers at Cash Register Store. The Sharp ER-A440 cash register is built for maximum reliability, even with heavy usage. In addition to its solid construction it can be customized according to the changing needs of your business. A user-friendly keyboard and built-in training mode will have your staff up and running in no time. Changing pricing or adding new items to your menu or stock is never a problem thanks to the Sharp ER-A440's easy programming feature. And with the standard RS-232 communication port, you can connect your PC to the Sharp ER-A440 cash register in order to upload or download item, pricing, and sales information in a matter of minutes! A single line validation capability allows the operator to mark documents such as checks and gift certificates with time and date information - making for better record keeping and security. Auto keys, which provide one touch recall of a series of key sequences, are easy to program as well, so functions can be automated in a matter of minutes.